Peek through the High Camp Archives for more interviews and exposes, only found here. Save 23%: Receive a free issue with your paid one-year subscription to Alpinist. Backcountry's White Issue is on sale now. We at Alpinist have produced 32 glossy issues, but it's a rare treat for readers to equate our editorial with the word of God. 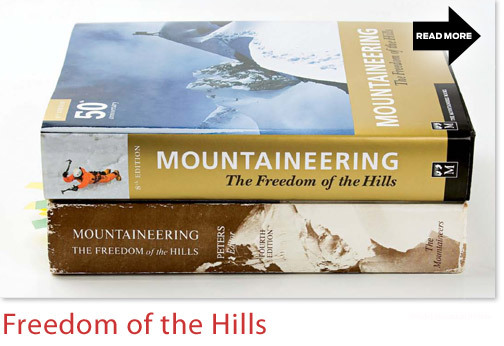 However, for another publication, Mountaineering: Freedom of the Hills, that comparison is the norm. Long ago, the climbing primer and reference tool was casually dubbed "The Bible." In celebration of Freedom's 50th anniversary and 8th edition, and its sheer and continued prevalence in our climbing world, we featured the tome in our latest Tool Users department. Pick up Alpinist 32 to unlock a few of Freedom's backstories. And click in to High Camp to discover how this Good Book shaped each of our editors, from 1970 to today.